The "locally produced food" movement is strongly beneficial, on several levels. First, it keeps food dollars in the community, supporting local prosperity. Second, it avoids long-distance transportation --- which can be costly and wasteful. Third, it results in fresher food. But is it enough? Local is commonly understood to mean "produced somewhere within a reasonable geographic proximity to where I live." But it doesn't say anything as to the farmer's use of chemicals, GMO inputs, synthetic fertilizers, or farm practices --- all of which are very important. As a result, food producers will often use the word "local" because it has marketing cachet --- and consumers will reach for the product without considering what the producer hasn't said. Most local producers of meat, dairy and eggs are feeding their animals genetically modified crops --- whether it is soy, alfalfa, or wheat. These feed inputs are grown using synthetic fertilizers, and Roundup. The animals are, in almost every instance, given pharmaceuticals at some time in their lives. Is any of this stated on the package? And what about groundwater pollution, destruction of microbial soil-based ecology, pesticides and herbicides which are sprayed into the air and local community, toxic food residue, mass pollinator die-offs, and intensive animal-confinement operations? Many "local" farmers are scoring low in all these areas, yet cashing-in on the illusion that somehow local means good. But the fact is, the nasty realities of modern industrial agriculture are poisoning families, animals, and the planet --- on an unprecedented and global scale. The next time you see a food product marketed as "local" remember that unless it is also certified "organic" or you personally know and trust the farmer, there could be a host of chemicals, genetically modified substances, collateral damage to the air, water and soil, and pharmaceuticals which went into its production. Don't buy it just because it's local. The best way to buy food is from local family farms which you know and trust, hopefully which are also certified organic. Ask them questions. If they say their food is produced "organically" yet aren't certified, then ask them for details because you might be surprised what they think "organic" means. If they say they don't use pesticides, ask them if they use fungicides or herbicides including Roundup, or synthetic fertilizers. If they sell animal products, ask them about confinement, and if the animals are allowed to live like they were designed to. 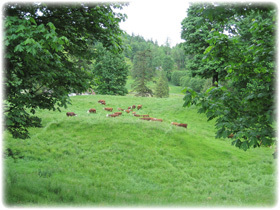 Our cows --- local, certified organic, and lifetime grass-only. 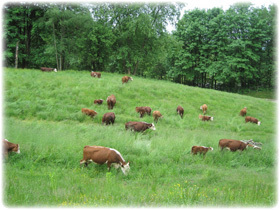 Our farm --- healthy animals, healthy soil. The process of organic certification involves a third-party inspection at least once per year, strict adherence to tightly-defined and exhaustive regulations, absolutely no GMO inputs, and on and on. Plus, it's voluntary --- meaning that as a farmer no one forces me to be certified organic, rather it's a choice I have made and am willing to pay money to third-party independent auditors to verify that I am in fact organic. Expensive, yes. Time consuming, very. Difficult, most definitely. But I deem it necessary in order for our customers to trust us. So what I'm saying is, please buy your food from local, certified organic farms. It's all-round better for people, animals, and the planet --- and the precious generations still to come.